Jim Kacian and Bruce Ross have selected 44 haibun and 24 haiga, with an historical preface by the editors and an index of authors. Stephen Addiss, Kay F. Anderson, an’ya, Guy Beining, Alice Benedict, et al. 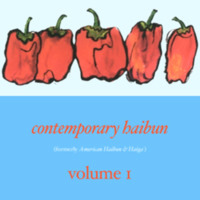 Kacian, Jim (editor in chief), “up against the window: American Haibun & Haiga Volume 1,” The Haiku Foundation Digital Library, accessed April 20, 2019, https://www.thehaikufoundation.org/omeka/items/show/39.